If you are looking for high quality, low priced electric forklift truck, you are in the right place. YTO is an experienced Chinese electric forklift truck manufacturer. 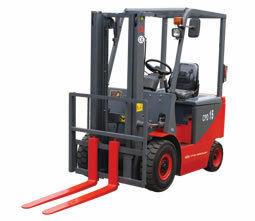 Our electric forklifts are available in three models, that is, CPD15, CPD20 and CPD25. Their mast tilt angle (forward/backward) is 6°/12°. The rated rotary speed of their working motor is 1550r/min. For more parameters about our electric forklift truck, please refer to the corresponding parameter table. 1. Our electric forklift truck uses low-speed high-torque DC series excited lifting motor, which not only increases the lifting speed in the case of free load, but also improves the working efficiency of the machine. 2. It is fitted with GE dual speed motor controller, so the hydraulic lifting motor starting without contact, without sparkle, without noise, can be achieved. This saves the repair cost, prolongs the service life of battery and reduces the operation cost of forklift truck. 3. Its control system is provided with low-voltage protection function. When the discharge capacity of battery reaches 80%, the protection system will start automatically and the hydraulic lifting system will stop working, making sure that the electric forklift truck can be driven to charging station for battery charging in time. 4. The high integrated digital combined dashboard of this construction machinery is of high reliability, high accuracy and good visibility. It could display the trouble code, thus enabling the operator to repair the machine in time. 5. The high strength fiber glass battery board is soundproof and heat-insulated. We produce electric forklift truck, tractor implement, wheel loader, road roller, rotary drilling rig, trailer, and harvester, just to name a few. If you intend to buy any of them, please feel free to contact us.